The kitchen has always been known as the heart of the home because it’s where families gather to prepare and eat meals. But today’s modern kitchens are also where people congregate to read, talk, open mail, entertain friends, use the computer, do homework, and relax after a long day. As a result, more and more children are spending time in the kitchen. And while it’s great that families are spending more time together, kitchens are inherently dangerous places, especially for children. Hot stoves, sharp knives, breakable glassware, scalding liquids, chemical cleansers, and hard, slippery surfaces are just some of the hazards facing children in the kitchen. Never hold an infant child in your arms while cooking. Instead, place him in a high chair or car seat, well away from the stove. For toddlers, set up a playpen that’s located a safe distance from the stove. Store all cleansers, pesticides and detergents in an upper cabinet or high shelf, well out of the reach of children. Secure base-cabinet doors with either adjustable slide locks or safety latches. Slide locks are more secure, but safety latches are easier for adults to operate. Remove small magnets from the refrigerator door. They pose a choking hazard for children. To prevent a child from turning on the stove, either remove the front knobs or install plastic safety covers. When possible, cook on the stove’s rear burners, and when using the front burners, turn pot handles inward. When using a countertop appliance, such as a toaster, blender, or coffeemaker, keep the power cord tucked back from the countertop edge, so a child can’t grab it. If your kitchen has a dining table, don’t use tablecloths. Kids love to tug on tablecloths, which could result in serious injury from broken glass or hot food. Remove or secure all kitchen stools to prevent a toddler from either pulling one down onto himself, or climbing up and falling. Plastic trash bags and grocery bags pose a suffocation hazard to small children. Keep all plastic bags out of reach in an upper cabinet. Remove knives and forks from drawers and store them out of the reach. Install childproof safety straps on the doors of ovens, refrigerators and trash compactors. 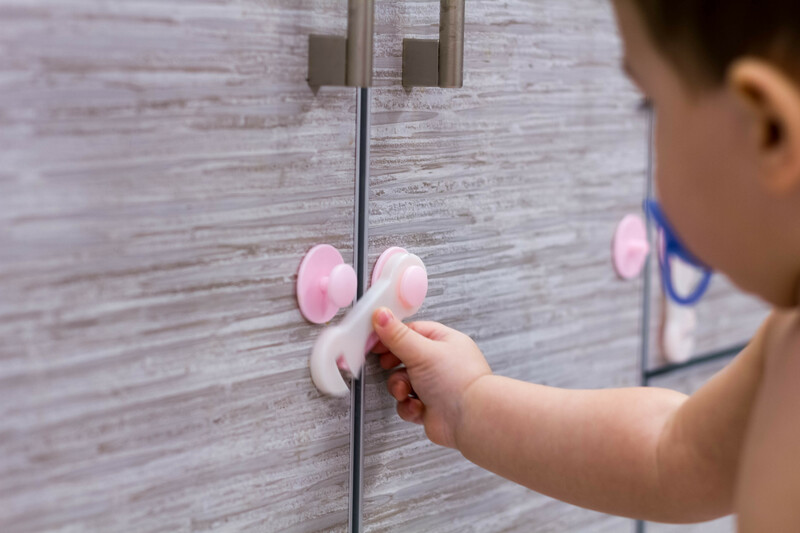 Keep the dishwasher locked to prevent a child from reaching in and grabbing a knife or glass. Insert safety covers into all kitchen electrical outlets, especially those on an island or peninsula. If any kitchen window or door has blinds or shades, tie the pull cord up and out of the way to avoid entangling, and possibly strangling a child. If you follow the aforementioned 16 rules, you’ll definitely create a much safer kitchen. Keep in mind, the very best way to protect a child in the kitchen—or anywhere else—is with diligent adult supervision. Learn more about tools that can help you build a safer kitchen by clicking HERE.